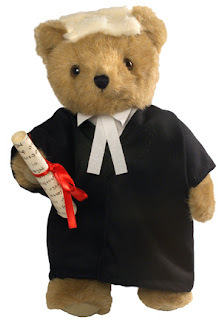 HomeCourt dressWigs and Gowns on Judges and Barristers – Silly Anachronism or Necessary Solemnity? Wigs and Gowns on Judges and Barristers – Silly Anachronism or Necessary Solemnity? I wore a wig and my gown in combat for the first time today. And the bloody tunic shirt with detachable collars, the wing collar and the bands. At present High Court judges have no less than five different sets of working dress, depending on the jurisdiction in which they are sitting and the season of the year. After widespread consultation it has been decided to simplify this and to cease wearing wigs, wing collars and bands in the civil and family jurisdictions. While there will never be unanimity of view about court dress, the desirability of these changes has a broad measure of agreement. Much has been of this both in the news media (BBC | Jurist | Reuters | The Telegraph | The Times | Yahoo! News) and more generally on the blogosphere (Bar Council Blog | Barrister Blog | Breaking Legal News | Charon QC | Court Dress at Current Awareness (Inner Temple) | Critical Estoppel | Geeklawyer | David’s Daily Diversions | Law Weblog | Legal Affairs | Legal Beagle (see also an earlier post on the point, and a contemporary post by Nearly Legal) | Lowering the Bar | Opinio Juris | Ruthie | Precedent | Scribal Terror | Sixth Form Law | Slightly Grumpy | The Law Blog | Twitchgamer). It’s a sad day for those of us who have always loved the pomp and circumstance of English justice: The judicial wig, the wing collar, and the variegated robes used in different courts will be no more civil cases. The British government — which has been known to knock down 11th century Norman churches just to widen a roadway — has decided to do away with four centuries of tradition to save a measly $600,000 a year. That presumably means that the next Nichols v. Raynbred or Adams v. Lindsell will delivered by somebody dressed (like an American judge) in a black polyester gown and Hush Puppies. Sic transit gloria mundi, if that’s the expression we want. I am deeply saddened to learn that the British judiciary and legal professional will be abandoning wigs and gowns for civil litigation (although the fancy dress will remain — for the time being — in criminal trials). There are lots of ways of thinking about this tragedy. For example, one might see it as the creeping triumph of Thomas Jefferson — the fiend who nixed wigs for the American legal profession. My own sense is that it is a further demystification of the law and a move to conceptualize courts as simply another bureaucracy and the legal profession as just another job. I am opposed. Of course, since at least Holmes it has be de rigeour for American legal intellectuals to treat the mystification of the law as nothing more than obfuscating nonsense. We are all for hard-headed realism about laws, judges, and lawyers. There is much to be said for this, but it think that it dramatically under estimates the importance of tradition, ritual, and mystique in contributing to judicial legitimacy. I also think that rituals are not simply for the hoi polloi. They also have a salutory effect on those who participate. I’ve heard more than one judge talk of the emotional and intellectual burden they feel when donning the judicial robe. This is good. I think that our judges are better for frequent, tactile reminders of their special role. I think that the American legal profession is weaker for lack of similar rituals and sacred clothing. Being required to dress up for a certain role is likely to concentrate the mind more fully on the role. Plus, barrister’s garb just looks cool. A barrister or a solicitor when appearing in any court shall not be required to wear a wig of the kind heretofore worn or any other wig of a ceremonial type. Anecdotal evidence suggests that only a handful of advocates have accepted this invitation, and it doesn’t apply to judges to at all. Update (20 July 2007): Tom Young in the comments below, and Captain Moonlight in the entertaining Nice trackies, M’Lud, both point out that Hardiman J in the Court of Criminal Appeal had occasion to rebuke a High Court judge displeased at defence counsel appearing in his court without a wig. Extracts from that judgment are below. The Captain concludes that he wouldn’t hold his breath that Ireland will follow Lord Phillips LCJ’s example any time soon; and I suspect that he is probably right in this. Moreover, it seems to me that the Lord Phillips LCJ’s compromise is not very elegant, only a partial implementation of a policy of simplification: the simplification doesn’t apply to criminal trials at all, and the judges of the Circuit Bench will continue to wear their existing gown. It seems to me that if something this radical is going to be done, it ought to be done across the board: by all means, phase it in slowly; but don’t stop half-way, applying the new rules to some advocates and judges in some courts, but not to others. That’s a recipe for confusion, and a prescription for recriminations and a quick revision. If we are to go down this path, we should follow it to the more logical destination of a single simple rule relating to court dress for all courts and occasions, for all judges sitting in them, and for all advocates appearing in them. I keep thinking about the wig manufacturers — did they do any lobbying to prevent this? Will the loss of the England and Wales civil court wig market put them out of business? There is, unfortunately, no doubt that in the course of the trial (but in the absence of the jury) the learned trial judge twice made somewhat arch and oblique comments about the fact that neither senior nor junior counsel for the defence was wearing a wig. They contended and, very creditably, counsel for the prosecution agreed, that the learned trial judgeâ€™s remarks were open only to the construction that he was displeased that Mr. [Jeremy] Maher [S.C.] and his junior Mr. Michael Delaney were not wearing wigs. â€œA barrister or a solicitor when appearing in any court shall not be required to wear a wig of the kind heretofore worn or any other wig of a ceremonial typeâ€?. It will be seen from this that, no doubt wisely and perhaps necessarily, the Oireachtas refrained from any attempt to specify the garb to be worn by professionals in court. But it did lay down that an advocate shall not be required to wear a wig and this law must be presumed to be consistent with the Constitution and valid. It must be said immediately that the learned trial judge did not attempt to require either counsel to wear a wig. But he commented in such a way as to make it quite clear to the barristers in question that he was displeased at their not wearing wigs and would be pleased if they did. To further this point he went out of his way to praise an apparently recently called barrister, who entered court wearing a wig, for his respect of the traditions of his profession. We were invited to consider this point as a component of a more general allegation of cumulative prejudice. In our view it is inconsistent with respect for the proposition that counsel may not be required to wear wigs to make arch (or any) remark about whether they are so equipped or not. A judge is in a powerful position; some of his powers are discretionary; advocates less doughty and experienced than Mr. Maher and Mr. Delaney might feel constrained in the interests of their client to conform with the judgeâ€™s obvious preferences in this regard. Needless to say there is no question in the conduct of this case of the slightest bias, or even appearance of bias in the conduct of the trial, but that is not the point. Mr. Maher submitted that, though the remarks were made in the absence of the jury, they can only have had a discouraging effect on his client who, before the case had begun properly saw his counsel in some form of conflict with the judge. We do not think that this is a real apprehension. The remarks, though plain as a pikestaff to any lawyer, were obliquely couched and cannot have meant anything to the defendant. Moreover, the record of the trial makes it perfectly clear that Mr. Barnes, a person in a position of very great difficulty which he brought on himself by his decision to burgle a dwellinghouse, was defended not merely competently but doughtily, ingeniously, and eloquently. Both on reading the transcript and on hearing the arguments addressed at this appeal, the Court was moved to admiration of the defence afforded to Mr. Barnes. Some criminal cases start and develop in a way which favours the defence: this one developed in the opposite way but the defence team never flinched. Mr. Maherâ€™s response to the first remark about wig wearing by the learned trial judge was, we venture to say, an entirely appropriate one. Hardiman J doesn’t name the High Court judge in question at any stage during the course of his judgment, but both Captain Moonlight (linking here) and Tom Young say it was Carney J. Thanks, guys, for bringing this episode to my attention.